German professor of exegesis, religious philosophy, and Semitic languages; born at Flehingen, Baden, 1851. He studied Orientalia at Leipsic under Fleischer, and at Strasburg under Nöldeke, and later at Berlin University, where he subsequently (1880) became professor of Semitic languages. In 1874 he was appointed professor of Hebrew, exegesis, and religious philosophy in the Rabbiner Seminar of the same city. For the last ten years he has lectured on Semitic and Jewish literature at the Veitel Heine Ephraim Institute. 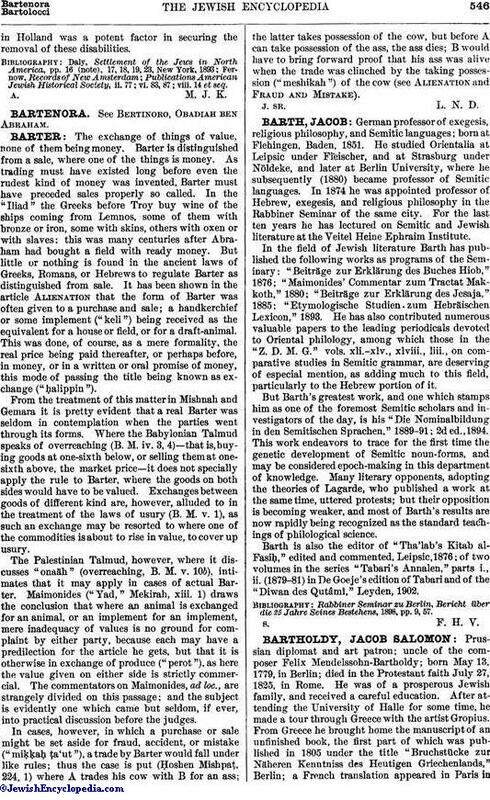 In the field of Jewish literature Barth has published the following works as programs of the Seminary: "Beiträge zur Erklärung des Buches Hiob," 1876; "Maimonides' Commentar zum Tractat Makkoth," 1880; "Beiträge zur Erklärung des Jesaja," 1885; "Etymologische Studien zum Hebräischen Lexicon," 1893. He has also contributed numerous valuable papers to the leading periodicals devoted to Oriental philology, among which those in the "Z. D. M. G." vols. xli.-xlv., xlviii., liii., on comparative studies in Semitic grammar, are deserving of especial mention, as adding much to this field, particularly to the Hebrew portion of it. But Barth's greatest work, and one which stamps him as one of the foremost Semitic scholars and investigators of the day, is his "Die Nominalbildung in den Semitischen Sprachen," 1889-91; 2d ed., 1894. This work endeavors to trace for the first time the genetic development of Semitic noun-forms, and may be considered epoch-making in this department of knowledge. Many literary opponents, adopting the theories of Lagarde, who published a work at the same time, uttered protests; but their opposition is becoming weaker, and most of Barth's results are now rapidly being recognized as the standard teachings of philological science. Barth is also the editor of "Tha'lab's Kitab al-Fasiḥ," edited and commented, Leipsic, 1876; of two volumes in the series "Tabari's Annalen," parts i., ii. (1879-81) in De Goeje's edition of Tabari and of the "Diwan des Qutâmî," Leyden, 1902. Rabbiner Seminar zu Berlin, Bericht über die 25 Jahre Seines Bestehens, 1898, pp. 9, 57.